Swirling bitterly over the airport, the wind is whipping the grey clouds overhead into a frenzy. Just outside the airport terminal (and with The Rock looming large behind us) we’re ushered into the back of a waiting BMW 5 Series, the darkly glazed door shutting with an ominous thud. No, this isn’t the opening scene to an overly dramatic Hollywood action thriller starring Dwayne Johnson. 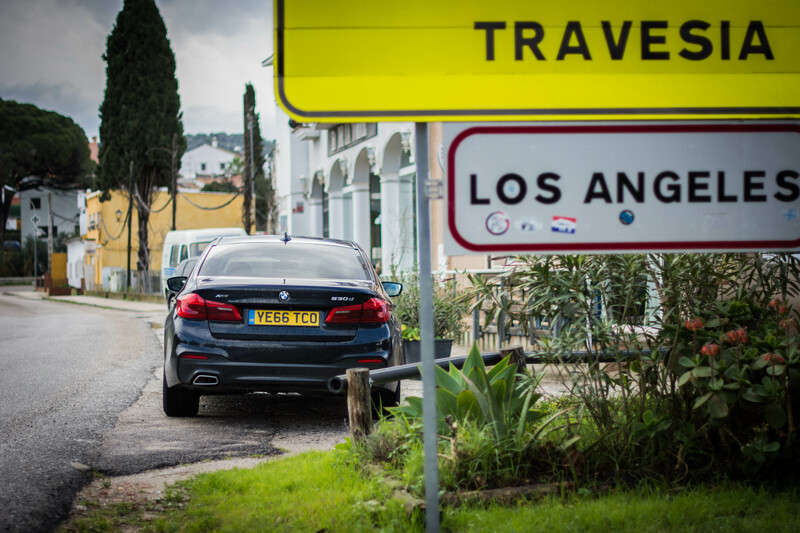 Instead, it’s the beginning of the latest Flat-Out road trip and yes, we’re starting it from the rear of the new BMW 530d xDrive. We wouldn’t normally bring you our thoughts from the back seat (we prefer being the nut behind the wheel) but, as first impressions of the new 5 Series go, it’s very positive. 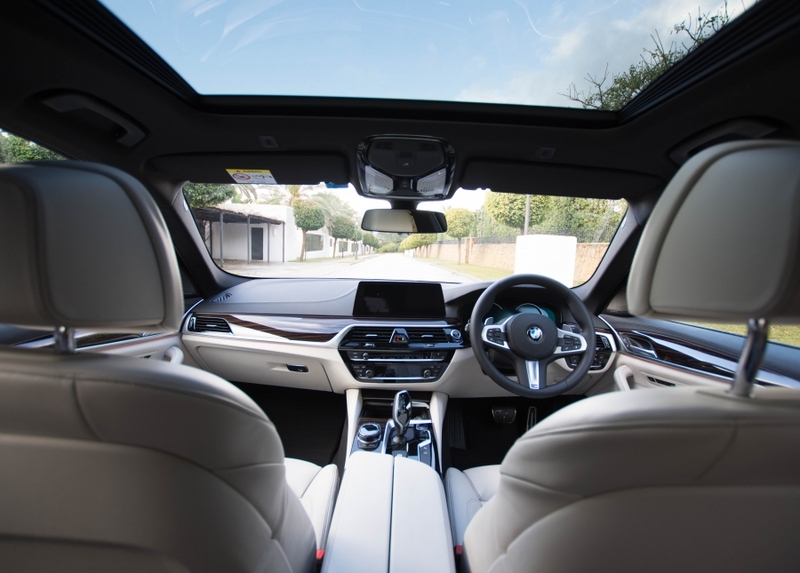 In fact, you’d struggle to realise that you’re not in the larger 7 Series as despite our six-foot-plus frame, the level of head and legroom borders on palatial. While the 5 Series’ big brother is likely to take most of the VIP work, BMW’s mid-size executive saloon is certainly no short straw. 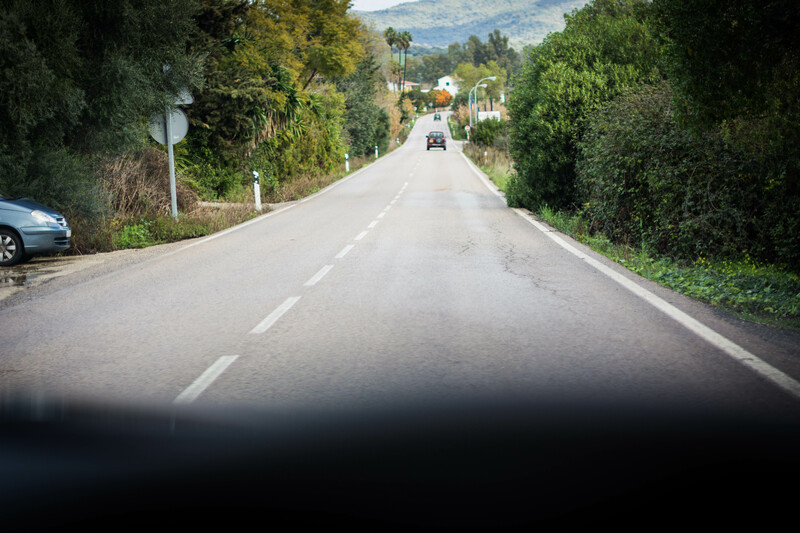 After clearing the conflagration of guards and checkpoints on the Gibraltan border, we’re soon cruising our way through Spanish territory, the famous Costa del Sol bordering the road to our right. 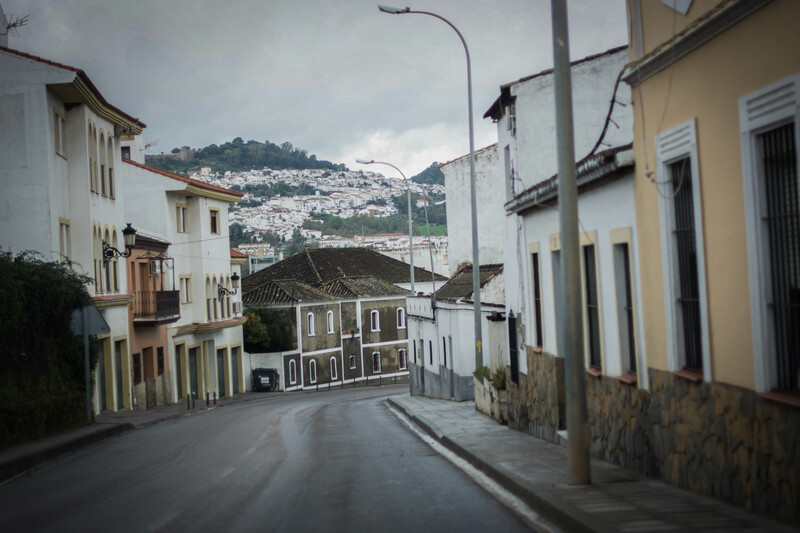 Unfortunately, it seems that the weather gods didn’t get the memo about our trip to Andalusia in search of some winter sun. Far from the welcoming sapphire hue we were expecting, the Atlantic Ocean appears as a stony mass, indistinguishable from the leaden sky as it stretches to the horizon and disappears around the curvature of the Earth. At the shoreline, the water is being whipped into a mild frenzy by the tumultuous winds, crashing against the rocks while along the coast, the palm trees shake violently, as if electrocuted by some unseen current. It may be a Sunday afternoon, but it’s not surprising that the locals are all safely tucked away inside their villas sheltering from the storm. Inside the new 530 xDrive though, our progress towards tonight’s hotel – the Finca Cortesin resort near Estepona – seems serene. The heated rear seats are on and, at a cruise, it’s almost impossible to hear the straight six diesel engine in action. It’s almost Rolls-Royce levels of refinement. Okay, so that’s maybe a little too much writer’s hyperbole but, still, it’s surprisingly stealthy and silky smooth as a passenger. This certainly isn’t your usual oil-burning airport runner, rattling away in a sooty cloud of black smoke; it’s refined, sophisticated, Teutonic. The latest 5 Series generation would be more than comfortable enough to sleep off the post-travel stupor in however, we manage to stave off the lure of sleep until we reach the hotel, using the last of our energy to explore our stunning residency for the evening (see ‘Where to Stay’). Overnight the tempestuous conditions have wearied themselves, the sky – carpeted the day before in a thick coating of ashen cloud – now allowing the area’s famous sunshine to break through in patches. A brief downpour ensures the Spanish tarmac is slick as we jump into the hot seat of the BMW 530d xDrive but, sitting this far south, it won’t be long before the roads are bone dry (as long as we can outrun the rain on today’s circuitous route through the nearby mountains). Heading southwest towards San Roque (first on the A-7 then the E-15) we begin by retracing our steps from the previous afternoon. Lined alternately by blocks of holiday lets and the ocean, the road here is neither challenging nor spectacular. Today it won’t be Spain’s coastal roads (now lined with deep midnight blue waters) that provide our automotive kicks. The schlep to the edge of the Parque Natural Los Alcornocales does let us get acquainted with the executive saloon’s new hi-tech abilities though. 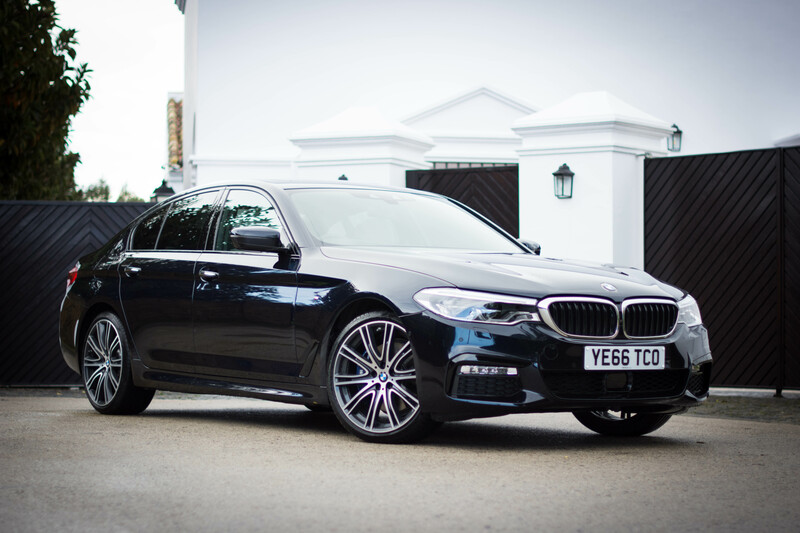 BMW is proudly proclaiming this as the most technologically advanced car they have ever built, flooding the G30 generation with gadgets and gizmos. 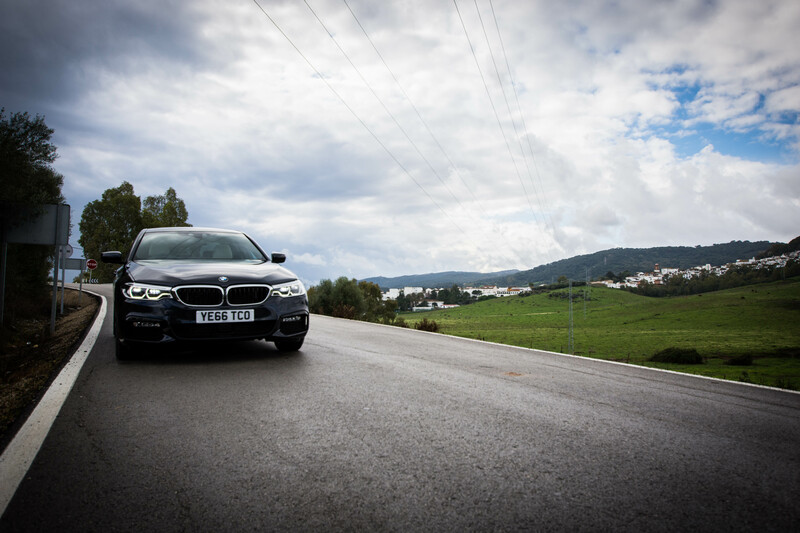 Laden with both cameras and radar sensors, this 5 Series can steer itself for up to 30 seconds, responding to the world around it at the push of a button. It may seemingly go against the ‘Ultimate Driving Machine’ tagline that Munich has been pushing for decades but, among the last remnants of the morning commuters, it’s a useful skill to have. 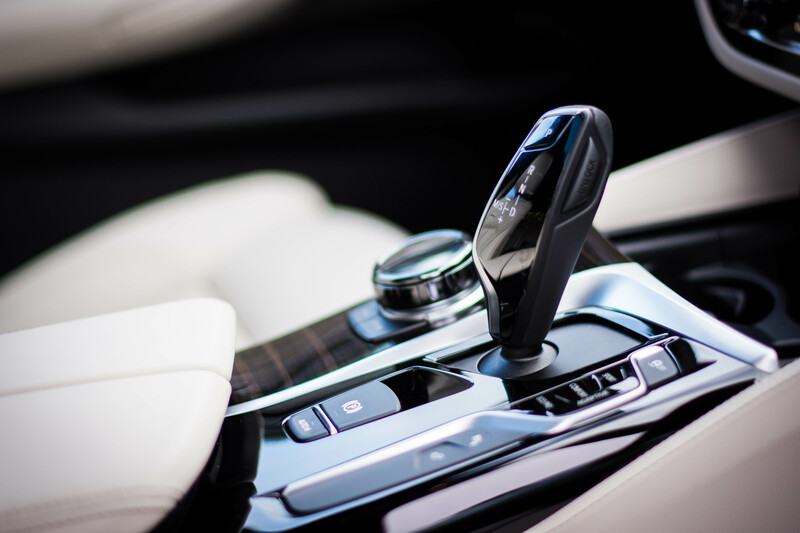 Especially so when every new 5 Series is now sold with a complimentary SIM card, allowing you to make use of myriad connected services (including a built-in music library courtesy of streaming service, Deezer). It’s as we change over to our favourite road trip tunes that the ‘Personal Co-pilot’ proves its worth, keeping us in our lane as we momentarily begin to drift. Suddenly, as we approach San Roque, Gibraltar (or more precisely, the back of The Rock) emerges monstrously from the south, the famous landmark’s peak swallowed above the clouds. To the north, the landscape is dominated by mountains. 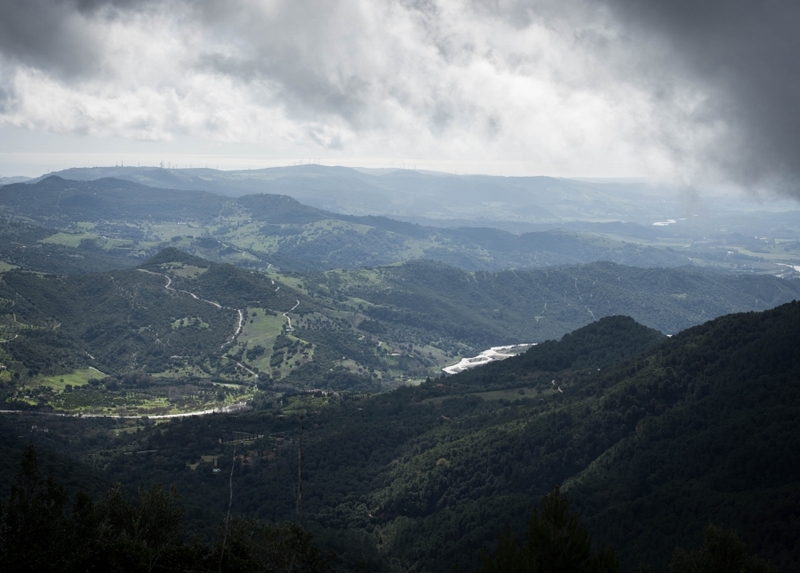 Behind each range another looms bigger, each hillside with its own personal smattering of fir and pine forests. The whole vista is pocketed with a Mordor-like mist too and, with the wind picking up again, it looks like the rain from the south could beat us up into the mountains. This new 5 Series better be able to hustle. Luxury doesn’t get much more luxurious than Finca Cortesin. This highly exclusive resort (featuring both main hotel suites and holiday villas) takes all your Costa del Sol preconceptions and throws them firmly out the window. Set a few kilometres back from the coast, the main hotel is a paragon of Mediterranean style, the vast suites littered with carefully curated furniture and artwork (much of which is available to purchase, at the right price). Each room has its own courtyard terrace, allowing you to enjoy the Spanish sun with a peace and privacy too. The resort’s restaurants (specialising in French, Italian and Spanish cuisine) satisfy your fine dining tastebuds, while the beach club is the perfect place to relax and destress. Keen golfers are spoilt for choice with Finca Cortesin a three-time host to the World Match Play Championship and automotive enthusiasts can eye-up their next purchase at the on-site classic car specialist. After joining the A-405, the tarmac ahead starts twisting and turning a little bit more. 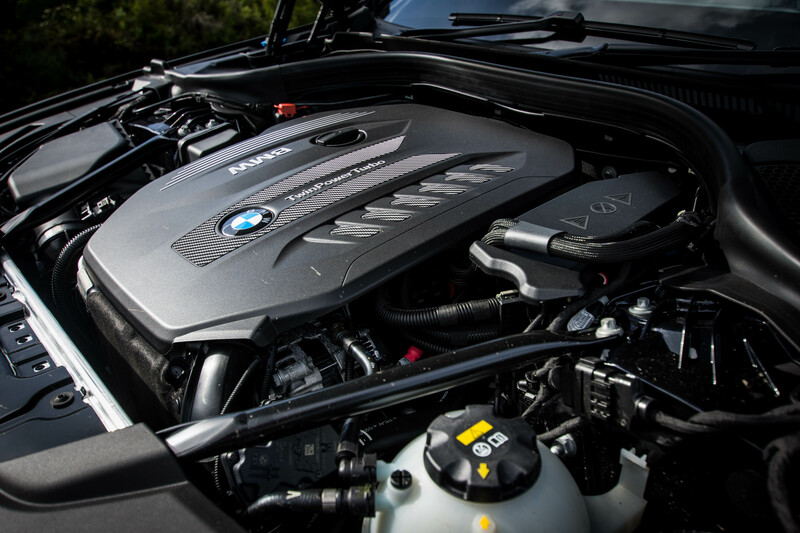 Initially, it’s nothing too strenuous – the 5 Series comfortably coping with the curves in its default drive mode – however, that all changes after 20 kilometres. Just after the village of Marchenilla, the road narrows, hemmed in on either side by lush tropical vegetation. The boundary of the tarmac is marked by deep, straight-cut ditches; there’s going to be no corner cutting through here. Wow! It only lasts for a few kilometres but it’s like a rally stage. After the first bend we quickly set the 530d into ‘Sport’ mode (heightening the car’s responses) before we’re immediately darting into another turn. And another. And another. The steering wheel is never straight for more than a moment, meaning we barely have time to notice when the edge of the road is suddenly marked not by a ditch by an unprotected drop down the hillside. It’s like a flat rollercoaster, bucking this way and that, the fun ending (for the moment) over a crested right-hander. 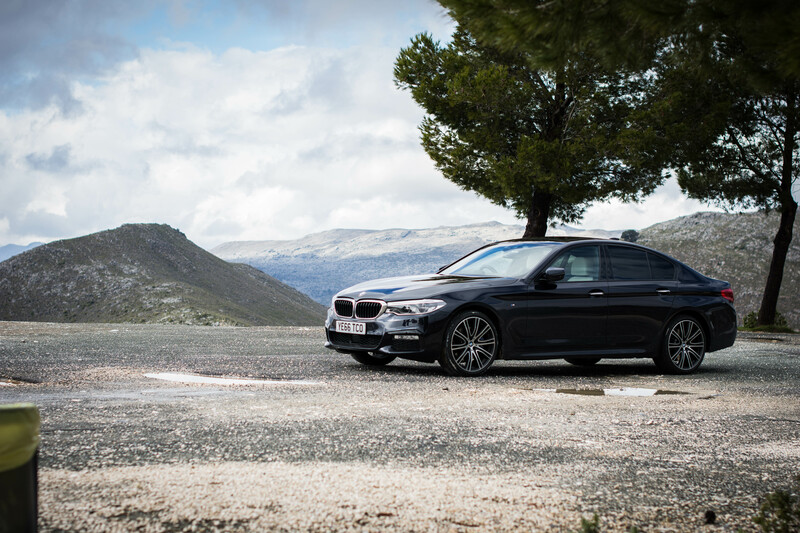 Getting hard on the power, the 5 Series starts to kick its tail out before the xDrive system steps in (without feeling too overbearing) to keep the saloon pointing in the right direction. Our next surprise comes a few moments later when we roll into Los Ángeles – population: 2,234. No, we haven’t suddenly been transported to California, but the route does soon do its best impression of the state’s famous canyon passes. 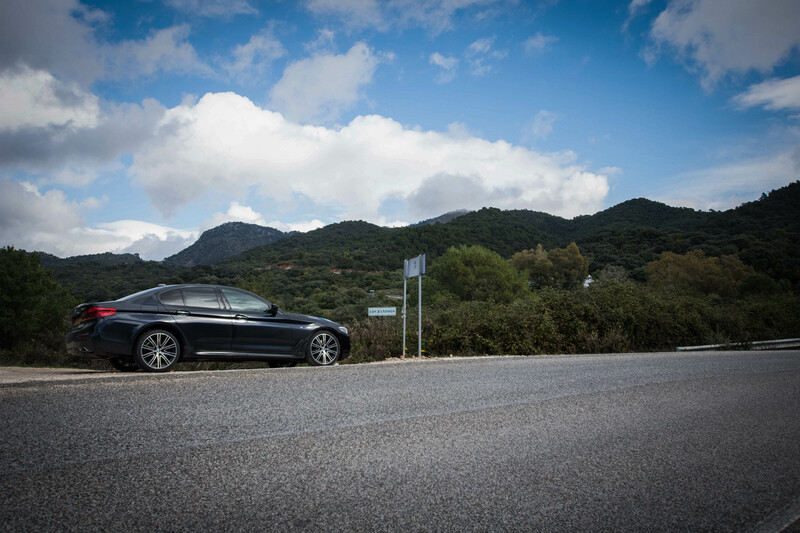 You can read part two of our Andalusian road trip in BMW’s new 530d xDrive here.